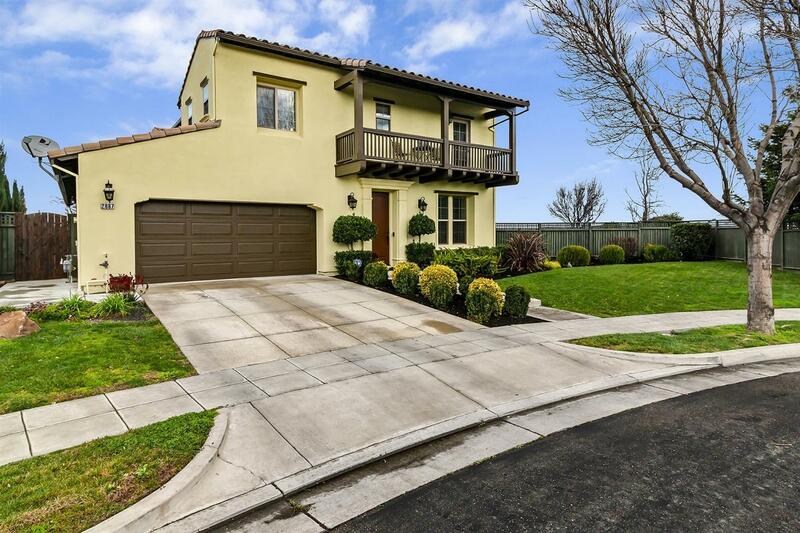 Welcome Home to your gorgeous Spanish Style house on a huge 9583 lot that features 2910 sq ft of living space plus a 3 car tandem garage. Enter into a beautiful hallway, formal living room & formal dining room that all have french doors leading to an intimate courtyard; kitchen with granite counter-tops with full back splash, cherry cabinets & stainless steel appliances; family room with gas fireplace & ceiling fan & door leading out to your beautiful backyard that has a covered patio with ceiling fan, built-in bbq, hot tub plus a huge grass area, downstairs bedroom & full bathroom; walk up an amazing staircase to a long hallway that leads to the left a private master bedroom & bathroom w/ a walk in closet, sunken tub & shower; to the right, one bedroom with a private balcony, second bedroom with both sharing a Jack & Jill bathroom; upstairs laundry room w/ Washer & Dryer included. Redbridge offers a General Store, swimming pool, tennis court, sport basketball court & parks.